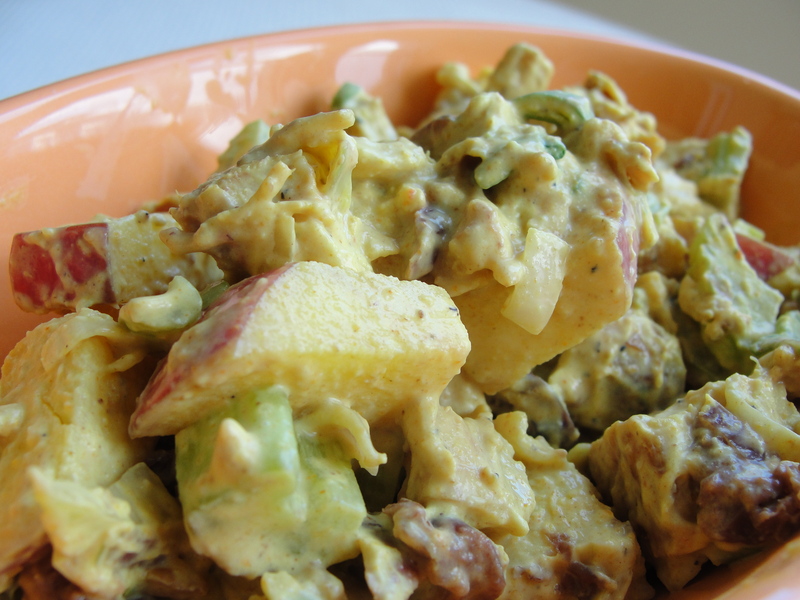 As we head into the weekend – that is hopefully filled with sunshine and lawn games – I wanted to sign off with a perfect picnic recipe for curried chicken salad. There is something about the cool temperature of the chicken mixed with the flavorful heat of the curry that screams summer. Or at least whispers spring. And what really makes this dish a favorite is the balance between the creamy mayo and other crisp ingredients. But mayonnaise, the key ingredient, usually hovers around 100mg of sodium per tablespoon, and this recipe often doesn’t make the low sodium cut. Boy’s Mom, however, didn’t take no for an answer. A few years ago, she picked up a Heart Healthy Living magazine from the doctor’s office and was delighted to find a bevy of tricks, tips, and recipes that would help her fill my tummy with good food. 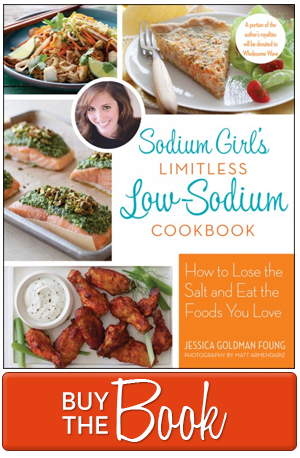 Her relationship with HHL began simple, using expert advice to create powerful, low sodium seasoning blends. But soon, she found that the more she read and the more she tried, the more confident she felt in taking risks and manipulating recipes on her own. Slow roasted pork, chocolate pudding, truffle tamales – the low sodium meals coming from her kitchen never disappointed. A constant ten out of ten. Among all the masterpieces, though, my absolute favorite has to be her Curried Chicken Salad which she expertly adapted from a HHL recipe. The original recipe calls for sour cream, which, for a dairy product, is actually very low in sodium. Only 20mg per tablespoon. But I like to keep my numbers as close to zero as possible and to fulfill that request, Boy’s Mom swapped the sour cream for crème fraîche. At zero mg of sodium, it is a light, creamy, sodium free substitution. She also left out the almonds (because I’m allergic) and used cranberries instead of raisins (because even raisins have about 10mg of sodium per serving). I have yet to make the chicken salad on my own, but I have eaten it many times and I can fully guarantee that this is a low sodium show stopper. So start mixing, chopping, and boiling. Have a wonderful weekend, go find some horseshoes, and chow on. 1. Heat a medium nonstick skillet over medium heat. 2. Coat chicken with olive oil and rub with onion powder and garlic powder. 3. Cook 4 to 5 minutes on each side or until no longer pink. Cool slightly and cut chicken into bite-size pieces. 4. In a medium bowl combine apple, green onion, and celery. Add the cooked chicken and cranberries. 5. 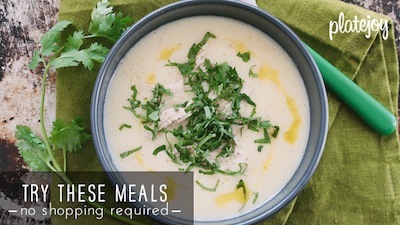 In separate bowl, combine crème fraîche, curry, honey, ground ginger, and cayenne pepper. Stir until smooth. Set dressing aside in the refrigerator. 6. When ready to serve, spoon dressing over the salad and stir to cover all. Cover and chill 1 hour. Scoop into bib lettuce leaves, slap on toasted, salt free bread, or eat on its own with a spoon. No matter how you snack, you’ll be satisfied. This sounds delicious! I make a very similar recipe using no salt added tuna. I add a few raisins and chopped almonds as well. YUM! I’m ready for a picnic! Just make sure you look for the low sodium tuna. Should be around 30mg per serving! Yum! I love this, sounds delish!